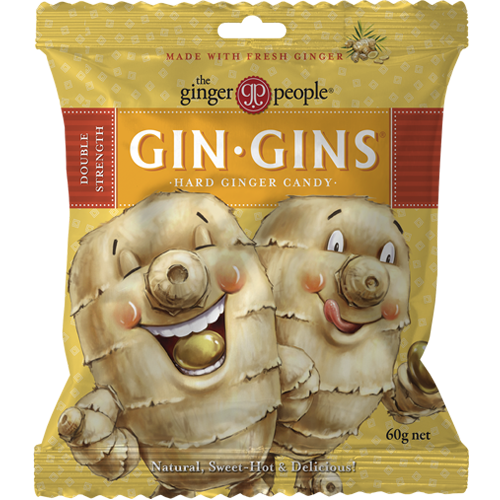 Take Gin Gins® Hard Ginger Candy with you wherever you go. An exercise in satisfaction, they’re easy to pack along, long-lasting, throat-soothing and full of flavor. A low-cal way to satisfy a sweet tooth and a rumbling tummy! And they’re packed with 16% fresh ginger! Our hard candies, made with 16% fresh ginger, are an exercise in satisfaction. Long-lasting, throat-soothing and full of flavor, these tasty treats satisfy a spicy-sweet tooth and a rumbling tummy. Don’t be fooled by their cuddly appearance, The Knob Twins are two tough characters. When they’ve got a big day (or a stinking cold!) nothing but a powerful pop of ginger will do.